Jewels are key to unlocking different stat bonuses in Monster Hunter World. Here's how to earn them as quickly as possible. Jewels are incredibly rare items in Monster Hunter World, that can boost critical stats for your character like vitality, affinity, armor bonuses, and more. In this Monster Hunter World Jewels guide, we'll be detailing how to farm Jewels in Monster Hunter World, so you get hold of the bonus items as quickly as possible. If you instead need anything else on the complex game of Monster Hunter World, including how to track down monster easily with Scout Flies, as well as how to capture monsters without fail using the Shock Trap and Tranq Bomb technique, head over to our Monster Hunter World guides walkthrough hub. Before we begin, we should note that Jewels aren't actually unlocked in Monster Hunter World until roughly 30 hours into the massive game. Once you've faced off against Zorah Magdaros for the second time during the 'Monumental Task' quest, you'll be tasked with taking down a Pukei-Pukei, immediately after. It's once you've defeated this Pukei-Pukei that you're then given the task of uncovering some mysterious tracks that belong to a Rathian. At this point, you’ll have unlocked new High Rank armor in MHW. While High Rank armor sets provide obvious defense boosts over their Low Rank counterparts, they also offer Jewel slots. 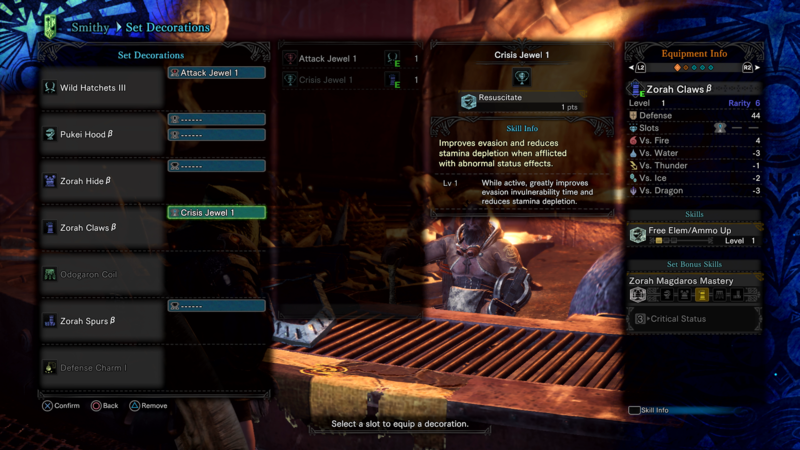 While you’re at the Smithy in Astera you can use these Jewel slots to equip any Jewels you have in your inventory But how can you reliably obtain Jewels in Monster Hunter World, and what are their actual benefits? Read on for all that and more. If you head to the MHW Quest Board in Astera and select the ‘Optional’ tab, you can then bring up a list of all the available optional quests, which will be ranked by difficulty. The High Rank optional quests are denoted by their orange stars, whereas the Low Rank quests are denoted by blue stars. This is also the same with story quests of Monster Hunter World, as you can tell if they’re High Rank quests by whether they have an orange star next to them on the listings page of the Quest Board. Whenever you complete a High Rank story quest or optional quest, you’ll be taken to the ‘Appraisal Box’ screen, where you can redeem any Jewels earned from completing the quest by selecting the ‘Appraise All’ option near the bottom of the box. Take care to select each Jewel and add them to your inventory, as selecting the option at the bottom again will immediately sell all the Jewels you’ve just earned. To add Jewels to your weapons and items, you’ll have to head to the Smithy in Astera. 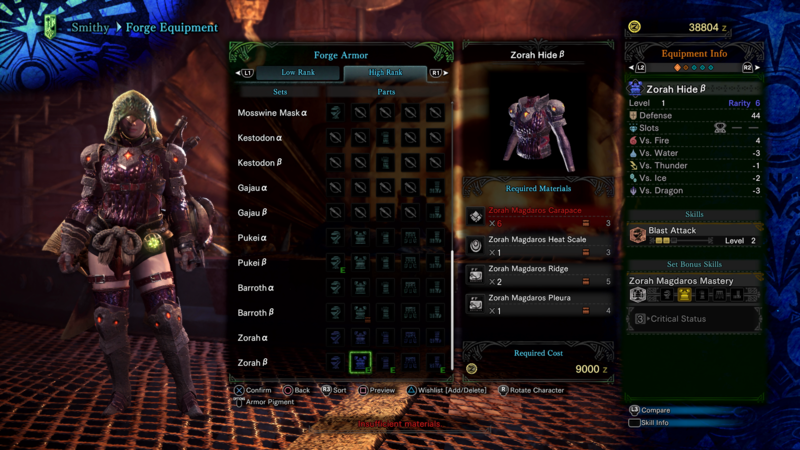 At this point, you can see whether your weapons or armor items have any Jewel slots by whether they have the ‘Slot’ denotion under their name and stat listings in your inventory. If they do, you can head down to the ‘Set Decorations’ option from the main menu of the Smithy, and add Jewels on to your items, giving them various statistical boosts, which we’ll explain more about just below. Attack - Boost Attack, Weapon Sharpness, etc. Defense - Boost Defense, Boost Elemental Defense, etc. Health - Increased Health, Boost Health Recovery Speed, etc. Stamina - Increased Stamina, Increased Stamina Regeneration, etc. Gunner - Firepower Boost, Boost Ammo Types/Coatings, etc. Preventative - Prevents against Sleep/Poison/Paralysis, etc. Gathering - Increase Carving Speed, Boost Fishing, etc. Based on the Jewels you have in your inventory, you’ll want to select which ones benefit you the most. For example, if you’re wielding Dual Blades then you won’t want to equip a Jewel that boosts ammo firepower for Bowguns. It’s also worth mentioning that you don’t outright bind a Jewel to an armor/weapon item, so you can attach and detach them freely at the Smithy whenever you wish. We might be all done with our Jewels guide for Monster Hunter World, but if you need anything else on the game, why not continue ahead to our complete weaponry guide, or or full armor guide, analysing every armor set in the game.